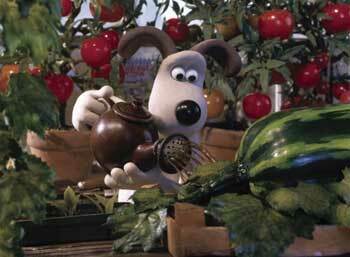 Veggie Propaganda: Gromit hopes to protect the produce against the depredations of the dreaded Were-Rabbit in the new Wallace and Gromit adventure. SPORADIC guerrilla battles still rage in the culture wars. Jonathan Miller of The New York Times suggests that the latest hot spot is "The Passion of the Penguins" (as the ineffable Michael Medved put it). March of the Penguins is the first film that conservative audiences could enjoy since That Jesus Movie. Apparently, the penguins (whom God obviously hates, considering the hoops She makes them jump through) represent a role model for today's illegitimacy-prone youth. Says editor Rich Lowry of the National Review, "Penguins are the really ideal example of monogamy." The little bird-nerds are actually an ideal example of serial monogamy: "They're monogamous, sort of," you'll remember Morgan Freeman drawling on the soundtrack. Unfortunately, that "monogamous, sort of" argument didn't get me out of hot water with my last girlfriend, anymore than it helped the lascivious Bill Clinton. And now comes the Wallace & Gromit: The Curse of the Were-Rabbit movie—vegetarian propaganda of the most shocking sort, enough to bring sweat to the well-greased palms of conservative bigfoots everywhere. In this charming opus, the claymation duo—meek inventor W. (voiced by Peter Sallis); mute but eloquent dog G.—are humane pest-control operators who use various gadgets to capture the bunnies that are devouring local gardens. The rabbits are a source of anxiety, since the Giant Vegetable Competition is coming up, sponsored by Lady Tottington (Helena Bonham Carter). Even Gromit is emotionally involved, as he is seen cosseting a prize watermelon under an electric blanket. The reverend is the first one to spot the Were-Rabbit, 25 feet of fuzz-covered appetite. Is the beast a result of Wallace's mind-altering gadgetry used to purge the antisocial habit of carrot-thievery from his captive rabbits? Gromit thinks not—the dog, always the brains of these Aardman cartoons—is the first to solve the riddle. But Lady Tottington's upper-class twit suitor, Victor Quartermaine (Ralph Fiennes), prefers to take an elephant gun to the creature. The Curse of the Were-Rabbit takes off from a few English tales—The Hound of the Baskervilles, the adventures of big-game hunter Allan Quartermain and that English fable A Clockwork Orange (in a far-from-violent bunny-reprogramming sequence). Executed with computer animation that even replicates the fingerprints the animators formerly left on the plasticine of their characters, the film still displays a low-tech heart. It evinces a warm affection for an England that's on the way out: the string-vest-wearing, Brown-Betty-tea-pot-wielding, cheeseboard-offering England, with semidetached villas, gloomy wallpaper and the sacred garden. At the beginning of an adventurous chase scene that would credit a much larger action movie, the directors pause near a railway aqueduct, glancing at the decay: handbills that have been put up and ripped down; an out-of-business restaurant. Although we learn that Gromit graduated from "Dogwarts School," the movie isn't tourist nostalgia, like Harry Potter's adventures. It notes lives of quiet desperation and exasperation—the latter visible in the worried, furrowed brow of Gromit, England's answer to Snoopy. The film took five years to make, and looks it. In these violent times, it radiates the tenderheartedness that can't bear to harm a hair on a hare's head. Wallace & Gromit: The Curse of the Were-Rabbit (G), a film by Nick Park and Steve Box, opens Friday valleywide.